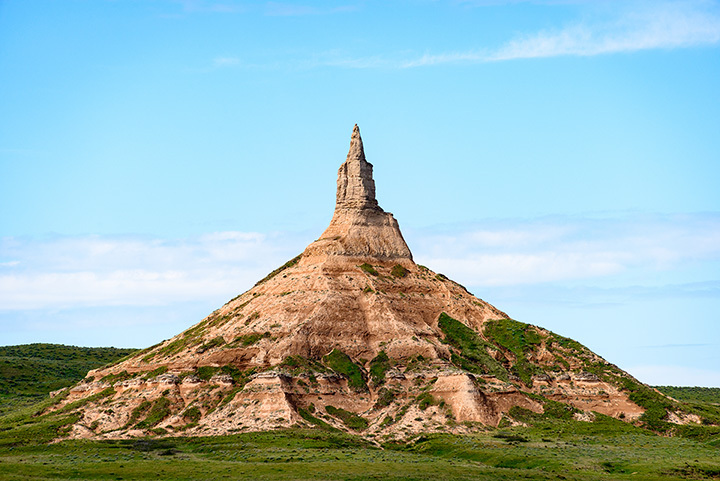 Nebraska - the state's name derives from a Native American word meaning "flat water," which seems appropriate considering that it has the largest underground aquifer in the country and more miles of river than any other state. Back in 1927, all that water came in handy when the powdered drink mix known as "Kool-Aid" was first invented in Nebraska. Perfect for washing down another state invention: the Reuben Sandwich. Among the celebrities hailing from the Cornhusker State: Fred Astaire, billionaire Warren Buffett, former president Gerald Ford and the "Godfather" himself, Marlon Brando. There are so many interesting things about Nebraska, you may wonder why they ever left. But in the meantime, here are 20 of the coolest things about the state that you must check out. It's one of the prettiest things in nature, the sight of nearly half a million cranes (with wingtips spanning 6 to 8 feet) feeding and hanging out along the Platte River. Watching them take flight at sunset will take your breath away. There are several locations to observe the event; find them here. Visit Omaha's TD Ameritrade Park for some Division I baseball! Home to the Creighton University Bluejays' men's baseball team, you can catch thrillling live sports action at this beautiful park. The pristine space can hold up to 35,000 spectators. This river has two advantages: first, it's one of the most scenic spots in the state. Second, it only runs about hip-deep in summer, so canoeing it makes it a little less scary if you happen to overturn. Great for kids or novices. The biggest lake in the state provides plenty of chances to camp, lounge on the beach, do some fishing or pretty much any other great waterside activity. Visitors to Omaha rave about the collection, which includes everything from ancient Egyptian pieces to important works of modern art. Plus, there's a wonderful floor-to-ceiling glasswork by Chihuly that always inspires "oohs" and "aahs." And admission is free! Every year during the holiday season, bird watchers descend upon Ponca State Park to help out the Audubon Society in their National Bird Count. And there's a chili feast afterwards. Check the website for exact dates. Besides 130 acres of animals, caves and more, this zoo boasts the largest indoor rainforest in North America. A nice way to escape a cold Nebraska day and warm up.